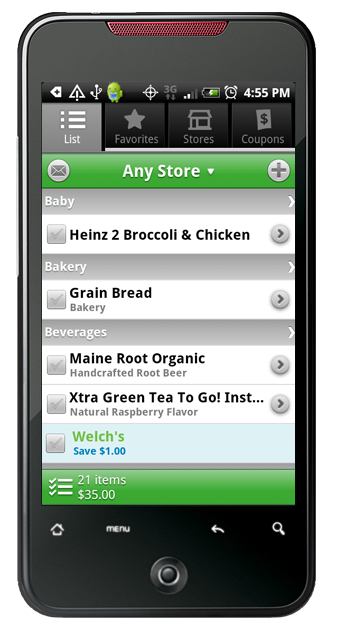 I've toyed around with a few different applications on my phone for grocery shopping. Andrew suggested I try Grocery IQ. He found out about it through Life Hacker. I decided to give it a go. Organized List: I can organize my groceries by category. This eliminates me having to go back to different areas in the store if I forget something because it wasn't ordered properly on my list. Syncs with online account: I do all my meal planning on Google Calendar. I can sign into my Grocery IQ account on my computer, which makes adding things very easy! (I type way faster on an actual computer than on my phone...) I enjoy being able to toggle back and forth between Google Calendar and Grocery IQ on my computer. Then the online account syncs up automatically with my phone! Email: My shopping lists can be emailed to anyone with the click of a button! This came in handy last week when my parents offered to go to Costco for us. I clicked the button to send my list to her. She was able to print it off and it was still organized by category! Shared account: I gave Andrew the password to my online account so he can add things to the list too. There are many other features, but I appreciate those the most. 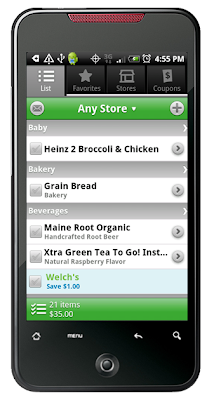 The downside to having your grocery list on your phone is you are staring at your phone the whole time you shop. I just think that looks bad and that people think I'm neglecting my kids. But I guess it's no different than staring at a paper grocery list. What do you use for your grocery list?